UPDATE: Ford has now officially opened the Ranger Raptor order books (8/2). We’re inching every bit closer to the launch of the much-anticipated Ford Ranger Raptor for the Philippine market (you can read our First Drive). But before that, we’d like to share a Public Service Announcement or PSA with you. It has come to Ford Philippines’s attention that several enterprising sales agents from various dealerships have quoted a ballpark retail price ranging somewhere between P 1.8 million to P 1.9 million. As early as now, Ford Philippines is categorically saying that this is all fake news. The American carmaker is warning the public that they have not yet given the official pricing of the Ranger Raptor for the Philippine market nor have they given out any sort of indicative pricing to any of their dealers or their sales agents. Ford Philippines says that dealers and their agents are free to talk about the Ranger Raptor and even take in a reservation fee, but clarified that it does not lock-in the price that dealer sales agents are quoting. Ford Philippines is directing would-be Ranger Raptor buyers to sign up for exclusive updates on their official website; something they’ve opened up as early at the Ranger Raptor’s digital unveil last September 2017. And it is something they continue to do so. Ford says that signing up for these exclusive updates is free and does not require any sort of commitment to purchase the upcoming Ranger Raptor. Ford Philippines reminds people that they will communicate any news about their products and services through their official website and social media channels. 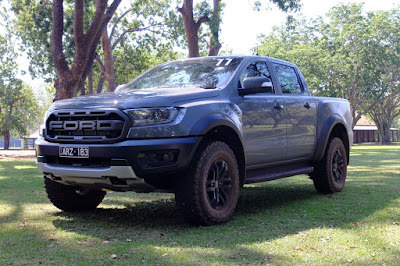 This article has been updated to point to the First Drive article as well as clarify that it is dealer agents, and not the dealer themselves, that have been giving misleading pricing on the Ranger Raptor.